Cunningham, a champion son of Cassini I, is a lovely “modern type” stallion with superior character. He was approved by the Holsteiner Verband in Germany in 2000 and imported to the USA shortly after being approved. Cunningham is a pre-potent stallion that stamps his get with a beautiful head, topline, and his easy going, hard working attitude. In his 5 years of showing in the rated Hunter Divisions, he has won 86 Championships, multiple Year End Awards, Nationally - USEF, USHJA, Silver Stirrup, AHHA, BWP, Zone 10, locally PCHA. Cunningham is currently showing in the A/O and the AA 51 & over, winning Championships there as well. He is the son of the International Grand Prix sire Cassini I and out of a mare by the Grand Prix dressage and jumper sire Contender. Cunningham’s dam is Iorella, Stamm 1907. This stamm is an old line know for it’s performance and work ethic. 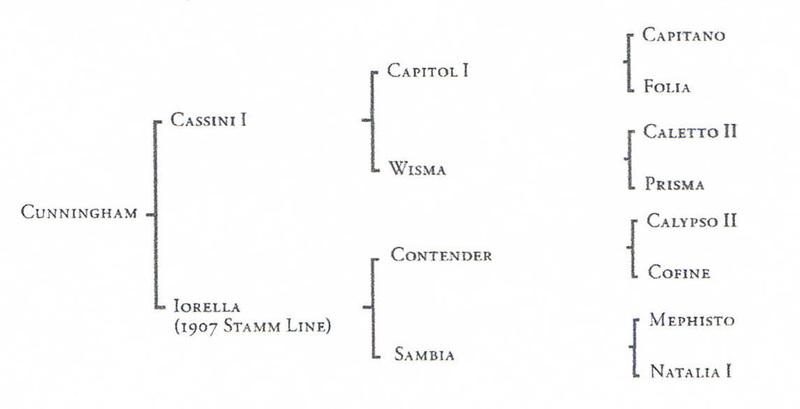 Stamm 1907 has produced 35 approved stallions including: Consul, Condino, Landmeister, Senator, Campari, Calando and Ramado. Cunningham is a breathtaking combination of talent and conformation. The favorite of grooms and handlers, he is a joy to watch and ride. In 2008 Cunningham was Champion in the Regular Conformation Hunter Division 20 times out of 20 Shows. 2008 Year End Awards: National USEF Champion Regular Conformation Hunter, USHJA Leading Point Earner Nationally in the Rated Hunter Divisions, National Silver Stirrup Champion Regular Conformation and Regular Working Hunters, National Champion AHHA Regular Conformation and Regular Working Hunters, Zone 10 and PCHA Champion Regular Conformation and Regular Working Hunters, Silver Stirrup Reserve Champion A/A Hunters50+. In 2009, Cunningham was Champion in the Regular Conformation Hunter Division 18 times out of 18 shows. He also showed 9 times in the A/O Division with his owner Mary Slouka. 2009 Year End Awards: National USEF Reserve Champion Regular Conformation and Regular Working Hunters, USHJA 2nd Place Most Points Earned by Hunter in the Rated Hunter Divisions, Silver Stirrup Champion Regular Conformation and Regular Working Hunters, AHHA Champion Regular Working and Regular Conformation Hunters, Zone 10 and PCHA Champion Regular Conformation Hunter, Zone10 and PCHA 3rd place Regular Working Hunter, Zone 10 and PCHA 5th place A/O 36+, GOLD Lifetime Achievement Award, Belgian Warmblood Association. 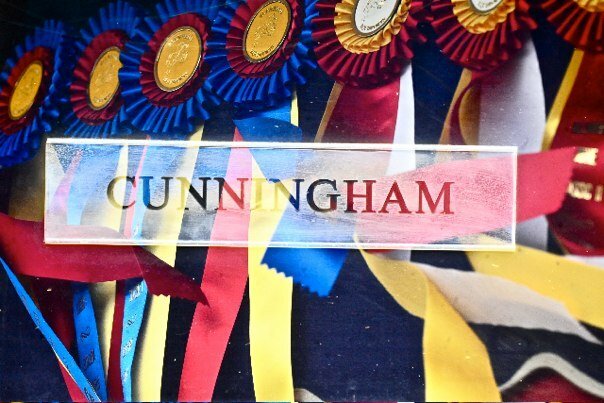 In 2010 , despite a very limited amount of showing, Cunningham won 8 out of 10 Championships and 2 Reserve Championships in the Regular Working Conformation Division. Shown 6 times in Adult Amateur 51 Over Hunters winning 3 Championships and 3 Reserve Championships. 2010 Year End Awards: Champion Regular Working Conformation Hunter Zone 10 and PCHA. National Silver Stirrup Regular Conformation Working Hunter Champion. Cunningham retired from the Regular Working Conformation Hunter Division at the end of the 2010 season.